Students, faculty and staff at Georgetown College have been organizing for the past few months to put pressure on their Board of Trustees to enact a policy not to discriminate against people just because of their sexual orientation for either employment or enrollment. Scott County KFTC members have been working in solidarity with activists on the campus, helping to think through strategy and pitching in as we can – and there have been a series of great events, meetings, and local communications work to help move the campaign forward. 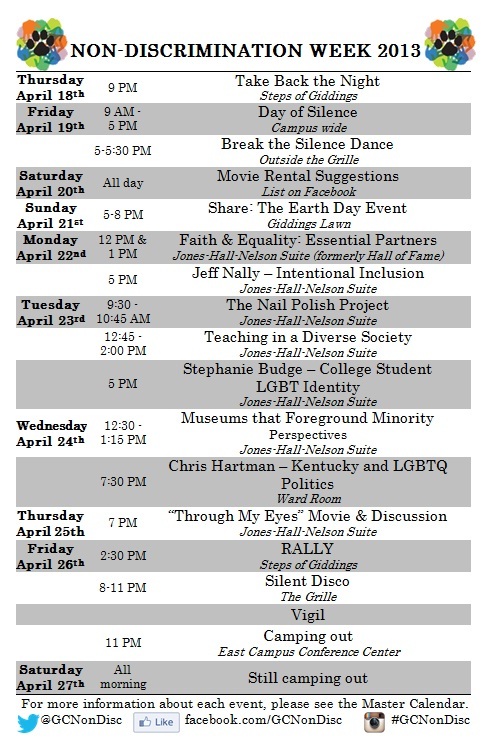 But for the next 10 days, the campaign is kicking into high gear with an incredible series of events including speakers, a concert, a day of silence, a vigil, rally, silent disco, and even a camping expedition on campus' main lawn. 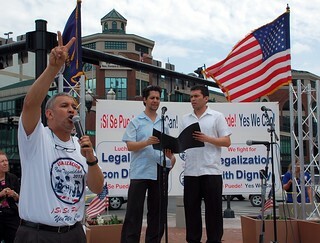 If you're in the area, please join us for one or more events. And look for pictures afterwards on this blog to see how things turn out. The Scott County Chapter recently has acted in support of a new group at Georgetown College that seeks to persuade the College to expand non-discrimination protections to include such things as sexual orientation. Georgetown College is a historically Baptist institution that traces its roots back to 1787, claiming as one its forebears Elijah Craig, the Kentucky Baptist preacher and Bourbon maker. Long a stronghold moderate Baptist thinking, the College adopted a formal policy prohibiting discrimination against gay students in 2008, College officials shy away from public acknowledgment of these policies. The College refused to formally sponsor a gay/student group until 2011, when gay students on campus boldly came out in the College newspaper and made the campus aware of the bullying and harassment to which they were at times subjected. Even then, the College insisted that the name of the group (Campus Spectrum) should not directly suggest anything about its mission, which is to welcome and support all students, regardless of sexual orientation. In the last few months, students and faculty of Georgetown College have been trying to a pass a non-discrimination policy on campus to make a safer space for gay and lesbian members of the community, making it impossible for students, faculty, or staff to be fired or expelled from the college just because of their secxal identity. A proposal from the faculty to create such a policy moved to the Board of Trustees late last year, but the Board decded to not move forward with it. The Scott County Chapter of KFTC decided to support the campaign by facilitating a "power analysis" to help clarify the objectives of the campaign, map out where stakeholders stand on the issue and how much influence the have, to help plan next steps. It was also a good space to root our work in why fighting discrimination and standing in solidarity woth the LGBT community is important. 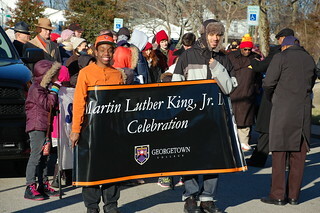 This weekend, KFTC members took part in powerful Martin Luther King Jr. marches and programs in Lexington and Georgetown, respectively. We marched with allies, talked to elected officials, and publicized upcoming events, but mostly used the space to reflect on and celebrate King's legacy and the legacy of the Civil Rights movement.